Football season is finally here. It's Pete's favorite time of the year. If it's yours too, you may want to include football into your wedding. So, for you, I put together a list of football-themed wedding ideas. This is definitely a theme where you could go overboard, so be sure to pick wisely. You want to have subtle football wedding ideas around, but not anything that makes your big day look more like a Super Bowl party instead of a wedding. 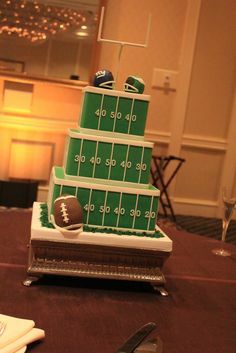 For a football-themed wedding, you need to go with green. Green dresses for your bridesmaids, green bow ties for the groomsmen, lots of greenery in your bouquets. Let the green of the field really shine through in your accents. 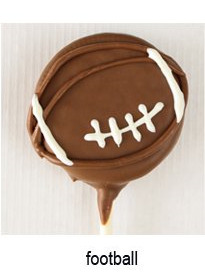 I'm in love with this football wedding cake from Momma T's Place (although the site no longer exists). If you remember, our wedding cake was super modern and on theme (it basically was a sand castle cake), but this is something special. If you want more of a traditional wedding cake, you could do one layer of the cake in the photo above and have it as your groom's cake. Or just have a traditional cake and add football helmet cake toppers. ... go with this playful football cake topper. 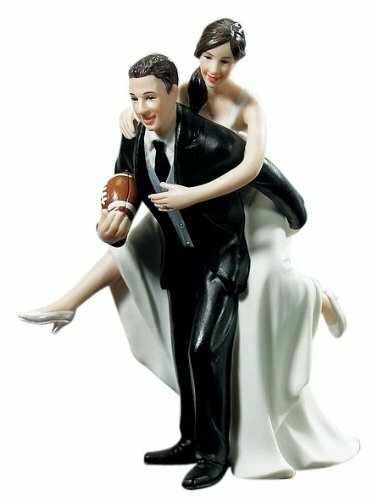 You still get your bride and groom on top of your cake, but when people are looking a little closer, they'll see the football in the groom's hand. Good, now that we have cake (my favorite part of a wedding) settled , let's start at the beginning -- the pre-game, if you will: invitations and your stationery suite. 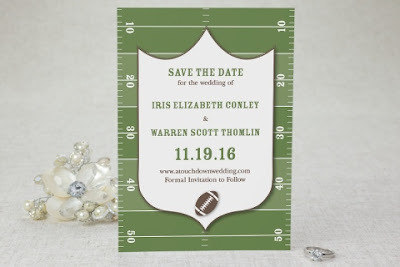 MagnetStreet makes a really great football-themed wedding invitation suite called Touchdown Wedding. You can get save the dates, invitations, RSVP cards, table numbers, and more. There is the outline of the NFL logo and a field behind the image. I actually really like this set. 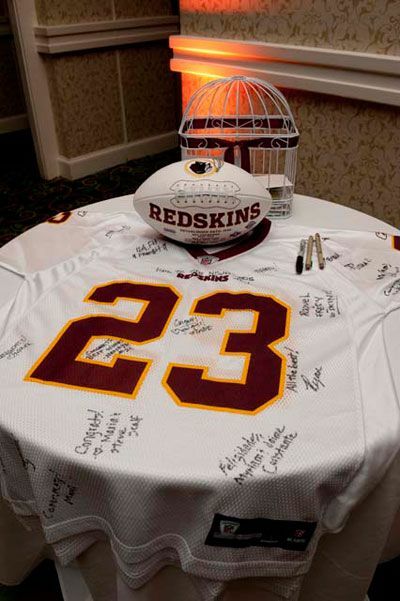 Plus, it's a way to tell your guests right from the start that football is going to be a huge part of your event. If your guests receive football-themed save the dates and invitations, they won't be surprised when they see your guys' uniforms ... um, wedding attire. Tuxedos with green or NFL ties, but don't stop there. I am slightly obsessed with this football rose boutineer from Sports Theme Weddings. It's so creative, and so different, and will definitely last a lot longer than a live rose corsage will last. Until I was writing this post, I had never seen anything like this, so I know your guests will be really awestruck by it too. Don't stop at the boutineer, though. Definitely go with fun cufflinks. 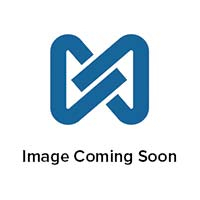 You can go with simple football cufflinks or you can pick up a NFL cufflink and tie bar set with a specific team. This is such a great idea for a groomsman gift. If your groom knows all his friends' favorite football teams (and I'm sure he does because we know who all our friends root for), this would be a really fun gift for them. If you want something more subtle for your groomsmen, I suggest NFL socks. 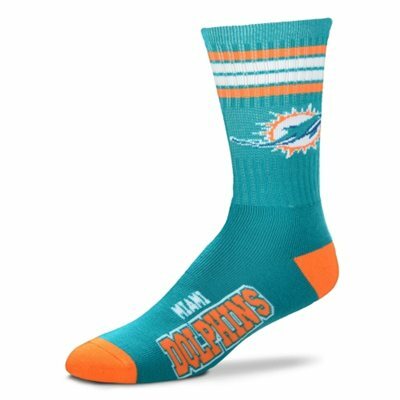 You can get each groomsman a different team, or maybe his favorite team, and have them wear the football socks on your wedding day. Be sure your photographer snaps a photo of all the men pulling up their pants legs to reveal the socks. Now, what about your attire? 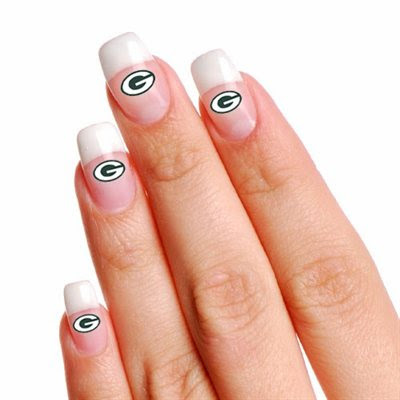 If you want something subtle, check out these football team nail tattoos. They come four to a pack, but I would suggest you only put one on each of your ring fingers (or pointer fingers, depending on which accent nail trend you fancy). To do something simple that doesn't take away from your dress at all, you can go with a football-themed garter belt. I found this one at Fanatics, which boasts a lot of college teams. That's cool if you love your college. But you could tweak this Michigan State garter belt by pulling off the Trojan helmet. Now you have one that looks like you wanted New York Jets colors. Works for me. Since, ya know, I'm a big Jets fan. 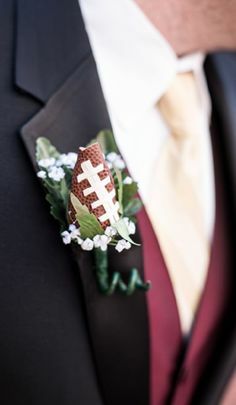 Speaking of your garter, instead of throwing it, have your groom throw a football. 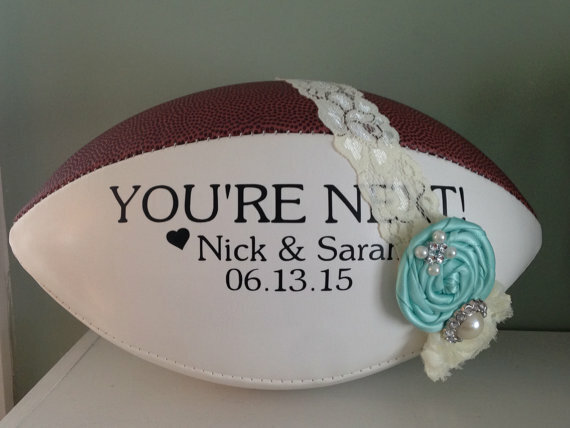 I found the personalized football in the photo above on Etsy, but the shop is taking a break. Instead, you can head over to Wilson and make a custom football there. Add your names and wedding date and "You're Next" because, really, that's what the garter belt catch means. While you're being non-traditional, go with a completely different guest book. Purchase your favorite player's jersey, or create your own personalized football jersey. Use your wedding date as the number and your new last name on the back and have your guests sign it. That would be something really fun to hang in the man cave after the wedding. 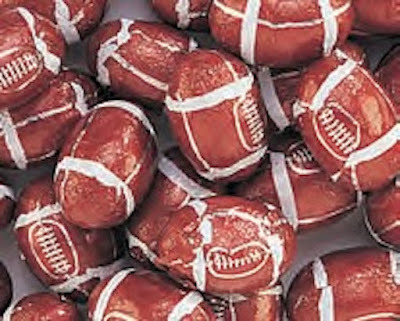 And of course, you need football wedding favors. You know I am always a fan of edible favors, so I vote with either foil wrapped chocolate footballs or football-shaped chocolate-dipped Oreo pops. Count me in for your wedding with either of those as favors. If you're looking for more sports themed wedding ideas, check out our Baseball Weddings Pinterest Board. 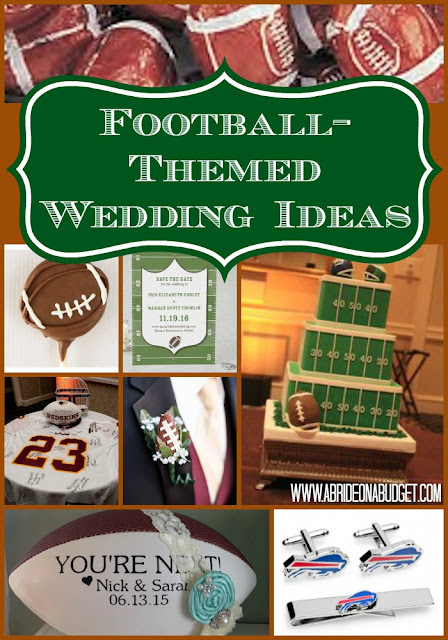 BRIDAL BABBLE: Which of these football-themed wedding ideas is your favorite? Great roundup of ideas for football lovers! 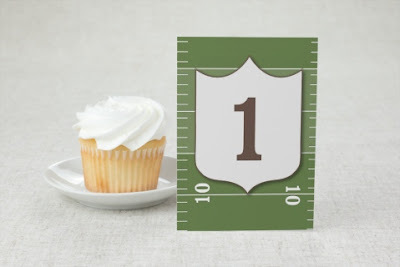 Especially love the Save the Date and football-themed bout! Super fun! Thanks for sharing. Thanks Heidi! I think a football-themed wedding can be so much fun, especially if you can get the bridal party to dress in team colors! What a fun theme!!! I may have to consider this theme if I get married again!! Could you imagine if you had rival teams getting married?? Rival teams would make it so much more fun! I'm a Jets fan and Pete's a Giants fan, so we have a welcome mat that has one team on each side with "A House Divided" written up top. It would definitely be fun to see a whole wedding like that. I love this post! Great idea for a couple of football lovers! Our oldest daughter got married last year and would have loved the MSU garter. Thank you for sharing with us this week at Celebrate Your Story, have a great weekend! I don't think anyone would have thought like this before. This is really a nice creativity and innovative idea and all the football players must be loving this. Wow, this is quite a list! Cool ideas for sure, just need to really be in football love to execute them lol. These are great wedding ideas for serious football fans. Perfect for those that met at a football game!